Many of us were disturbed by the bizarre way the BNP tried to twist Christian imagery in their recent election campaign to leverage decent people into Fascist ideology. It comes as no surprise that exactly the same thing was done in Germany in the 1930’s. 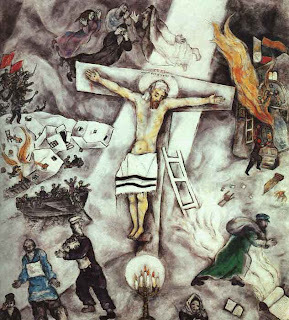 Susannah Heschel logs the process at the highest levels in her study The Aryan Jesus: Christian Theologians and the Bible in Nazi Germany. Jesus the Jew was rebranded by Eisenach Institute theologians, bizarrely, as an icon of Aryan racial “purity,” reflecting the Nationalist, Racist fantasies of the age. Jesus is Christianity's burning bush. His presence beckons to his followers in each generation, calling them to stand before him fully present and attentive to the rule and realm of God brought near in each encounter with the neighbor. The confessional task of letting Jesus be who and what he is remains a critical and a persisting concern. Jesus can never not be a Galilean Jew. But the temptation to leave him behind in pursuit of an ideologically configured Christ beckons to each generation that sets out to find him. The Aryan Jesus reminds us of what is at stake. Thanks for this timely post +Alan. However, the more I reflect on the issue the more convinced I am that there is a disjuncture between what is studied about Jesus the Jew in academic circles and what is actually taught and reflected upon in the pulpit and home/Bible study group and this continues to create a real problem. How many Christians still hold a picture of Jesus in their minds of the Jesus of Victorian sentimentality; all white robes and flowing blond hair and beard? How much of our church art, e.g. stain glass windows, perpetuates that image? The challenge to those of us called to teach the faith is to reach the point where, when the BNP puts up its distorted picture of Jesus, people simply laugh because it is so clearly ridiculous and so far removed from the Jesus of history and faith. And isn't that true also of almost everything else biblical scholars have unearthed in the last 150 years? We seem to be absolutely determined not to let new findings and new theology interfere with how we've always believed things to be. It seems safer than to challenge people, but it will probably turn out to have been a costly mistake in the future. Thanks, Philip & Erika. I suspect the whole dissonance between the academy and the streets serves us really badly here. I remember Gerd Theissen's "Shadow of the Galilean" as a really good attempt to be real about Jesus on a popular level — but it's not easy in one of the only countries in the world where "academic" is usually a term of abuse. Failing that, we're stuck with the "making jesus in our own image" thing, and, probably turning him into a mascot who just happens to share our prejudices, thereby validating them. Nice to believe Jesus is one of us (= incarnation) but blowed if he has to be a Daily Mail reading, bigoted little Englander! A timely reminder that Jesus didn't look like a Viking! I am also reminded of Geza Vermes' "Jesus the Jew"
The problem of dissonance between the academy and the streets is a shared responsibility. It is true that many preachers and teachers seem to leave much of what they have learnt back in the library or study when they reach the pulpit. However, it is also true that many in the academy have tried to separate study from the worshipping community, in the classic liberal educational tradition (liberal not here denoting a theological position). In other words the study of Jesus is a purely academic exercise typified by the 'quests' for the historical Jesus, which has at its worst resulted in a disasterous separation between the Jesus of history and the Jesus of faith. It is also disingenuous as there are unacknowledged presuppositions behind this approach e.g. scepticism of the miraculous and conviction that Jesus was little more than a Jewish peasant teacher. These presuppositions are also convictions shaping the outcome. That is not to dismiss the quests for the historical Jesus, just to indicate that there are issues. We need to take very seriously the rich resources of the academy in our understanding of the scriptures but this needs to be rooted in the worshipping community not ring fenced from it. I agree that Theissen's 'Shadow of the Galilean' is a good attempt, though it failed for me because at times the theology got in the way of the narrative and made the story feel rather stilted and contrived. Have you come across Anne Rice's series 'Christ the Lord'? These are fictional accounts of the life of Christ but rooted in meticulous research and a tremendous breadth of theological reading. In her notes Rice particularly commends Tom Wright's work as an invaluable resource. I wrote a blog on Rice's approach at http://tiny.cc/U7SCI . Thanks again for raising this stimulating and crucial issue. Thanks, Mike. I know Vermes has produced a sort of 30 years on update on jesus the Jew, but it was the book that made me realise how far we had to go. That and (from the middle ages) Davies "Setting of the Sermon on the Mount." Philip, thanks so much for looking at this divide from the other end. One of my sadnesses is that Brevard Childs was only getting going as I was leaving the academy, but the idea that these are documents designed to be interpreted within a faith matrix (and canonical purpose) does seem very helpful. To understand them you don't need the same faith, but you have to be aware that the highly synthetic Victorian historicist matrix that informed a lot of the game before the 1980's is no more inherently absolute than any other, and at least some awarness of the documents' original hermeneutic matrix gives a datum point in understanding them without which they easily become incomprehensible as anything but curiosities. Ill check the leads yu gave, which sound greatly interesting. I know what you mean about Gerd Theissen. His Jesus was, when all's said and done, quite a Lutheran character! But I liked his line of approach. All academic research includes bias, the only thing that really matters is to which the academics themselves recognise and admit it. There has to be a really sensitive balance between research within a faith community. Faith rouses strong feelings and the danger not to recognise, not to include or to misrepresent findings that feel threatening is great. Ideally, theological education and the training of ordinands at each of the universities, colleges and training institutions should be undertaken by a cross selection of academics from the different faith traditions within Anglicanism, so that bias is more naturally laid open, and also publicly accepted as inevitable. It is then up to the students to grow into taking these differences seriously, respecting the integrities of the different approaches, and returning to their worship communities with a more tolerant understanding of different theologies and of those they disagree with. Thanks, Erika, for putting your finger on one of the great paradoxes of the way the C of E clergy learn theology. Many courses provide exactly what you are suggesting we need — an awareness among prospective gardeners of the richness, diversity and differing needs of the various sections of the garden. The conventional colleges, however, have a strand of DNA that arises from the fact that they were founded because someone 100 years ago wished to turn out new model clergy who, by definition, would be aligned with one particular party definition of Church, to the exclusion of others. Actually it often works out OK because people change, and don't perform to spec in various ways. All in all the vigorously sectarian interpretations of how to be an Anglican are probably more confined to their own now than they were 20 years ago, and most people have helpful experience of more than one mode of discipleship. It's still a structural anomaly, though. "Jesus can never not be a Galilean Jew. But the temptation to leave him behind in pursuit of an ideologically configured Christ beckons to each generation that sets out to find him. The Aryan Jesus reminds us of what is at stake." I read this as a warning against reconfiguring Jesus in any form to suit our ideology, whether through the lens of feminist theology, Black theology or white supremacism! I trained for ordination at the Queen's Foundation in Birmingham where I had the opportunity to engage with Black and Asian theology and also with Christians from different contexts. I heard how the Bible had been used to impose a particular interpretation of reality which made the disadvantaged more disadvantaged. I think it's important to remember Jesus the Galilean Jew, but also that this is only useful as a way of getting us thinking about Jesus as 'other'. To me this is part of trying to engage with a personal relationship with Jesus. If we use it as a way of labelling or defining him or pinning our preconceptions onto him, the Galilean Jew is really no better than the blond, blue eyed Jesus as a way of understanding him.